Toyota's Bernhard ten Brinke, sitting in second place overall this morning, is losing almost 8 minutes at km 51 after a lacklustre start. 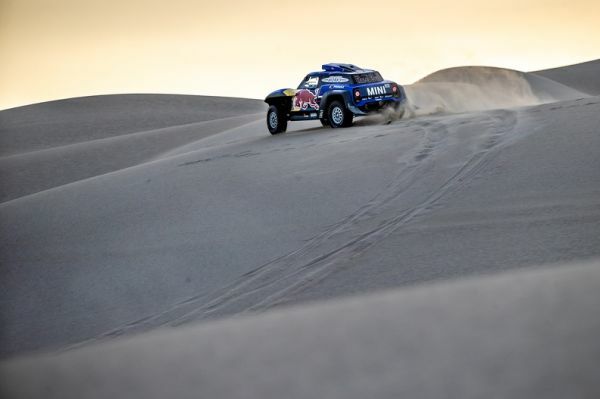 It didn't take long for Nasser Al-Attiyah and Stéphane Peterhansel to take control of the special. The two drivers went through km 51 tied on time, with Sébastien Loeb 21 seconds back. Cyril Despres is just 40 seconds behind the leading duo, but Carlos Sainz has already been stuck at km 38 for half an hour! Toby Price, Ricky Brabec are Matthias Walkner are having a day to forget. The Aussie trailed De Soultrait by 20 minutes at CP2, with the American 26 minutes back and the Austrian 29 minutes off the pace. Xavier de Soultrait is really stealing the show today. The Yamaha rider's impeccable performance put him over 6 minutes ahead of Pablo Quintanilla at CP2. The quad race is keeping us on the edge of our seats. A mere four seconds separate the top three riders after 100 kilometres! Manuel Andújar, Nicolás Cavigliasso and Gustavo Gallego are making it an Argentinian 1-2-3 so far. After a brilliant start, Carlos Sainz has been at a standstill at km 38 for quite a while now. A serious blow for the 2018 champion, who needs to get going as soon as possible.